This concise, thoroughly updated text provides a comprehensive, state-of-the art review of neurology and will serve as a highly practical resource for neurology residents and medical students. Emphasizing a practical approach to common neurologic disorders, the author blends chapters that cover the evaluation of specific complaints (confusion, dizziness and vertigo, visual loss, headache and facial pain) with others that focus on particular disorders (Parkinsonism, multiple sclerosis, dementia). 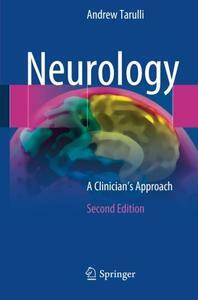 Noting the core practice of neurology is largely unchanged from years ago and still largely done at the bedside, the author emphasizes the importance of acquiring expertise in the time-tested, classical techniques of history taking, directed examination, and localization. Toward that, the author encourages a focus on the key clinical pathways for diagnosis and management. A wide range of clinical pearls are provided and the diagrams and illustrations are well-designed and comprehensible, as are the clinical images (EEGs, CT, MRI) which provide excellent examples of a variety of neurologic disorders. The discussions and algorithms offered are evidence-based and state-of-the-art. Importantly, the author discusses a range of new, powerful treatments available for various disorders, including stroke, epilepsy, and multiple sclerosis. Concise and well-written, Neurology: A Clinician’s Approach, 2nd Edition is an invaluable resource that will again serve as a very useful, gold-standard resource for trainees.